[PDF] Prions: A Challenge for Science, Medicine and the Public Health System (Contributions to Microbiology, Vol. 11) (v. 11) | Free eBooks Download - EBOOKEE! 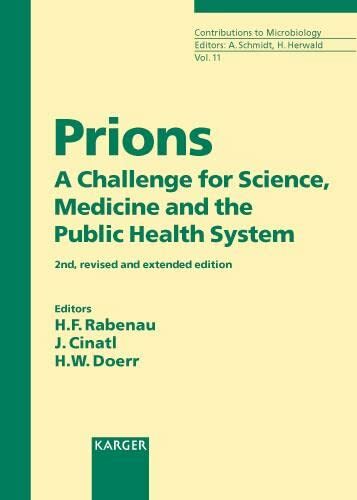 Description: This second, completely revised and extended edition of "Prions: A Challenge for Science, Medicine and the Public Health System" is a comprehensive, up-to-date review of prions and prion-associated diseases. Leading scientists discuss the structure, molecular biology and origin of prions as well as strain variations and species barriers. Human prion diseases, prion inactivation and risks to public health are considered in detail. The new edition provides an update on basic findings of the last three years since publication of the previous edition and emphasizes practical aspects of fighting human and animal prion diseases. In addition, chapters on regulatory aspects of BSE and CJD as well as on veterinary measures have been included. A valuable single source of information on what is currently known about prions, this book will be of interest to any scientist or clinician who wants to keep up with the latest developments in this fast-moving field. No comments for "[PDF] Prions: A Challenge for Science, Medicine and the Public Health System (Contributions to Microbiology, Vol. 11) (v. 11)".